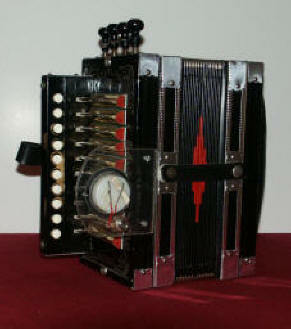 This is one of my Cajun Accordions, hand-made by Clarence "Junior" Martin of Lafayette, Louisiana. Just a few years ago, during the course of a family history research project, I developed an interest in the French music of North America. Musical metaphors seemed to have evolved intact from seventeenth century France to eighteenth century Canada, and were essential to my appreciation of the cultures and lifestyles of my ancestors. Then I discovered that these same metaphors had also found their way into the music of southern Louisiana. When I discovered Cajun music, I felt that I had found a way to relive history. Nine individuals become a cohesive musical unit in less than a week, thanks to Eddie LeJeune. 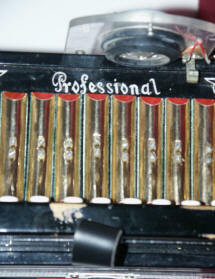 Only ten buttons...but, Oh What A Sound! Lovingly crafted by Marc Savoy, it brings to life the Cajun spirit of his grandfather. Marc and his wife Ann Allen Savoy have teamed up to keep the tradition of authentic Cajun music alive. 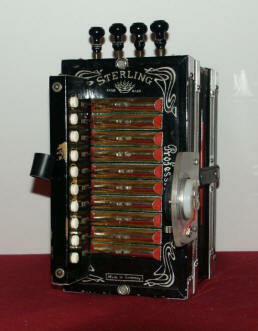 Junior builds a fine accordion. I know...because I own one. Next time you're in Louisiana, take the time to visit this gallery in the town of Scott, just west of Lafayette. This is what a Sterling looks like. Beware of imitations. © 2005 L'Association des Familles Meloche Ltd.